Photo: GRIDSERVE, in association with Arup. And they haven't forgotten the coffee. Forecourts and charging points have been the bane of electric car drivers lives - broken chargers, charging bays occupied by non-EV drivers and queues for a limited number of charging points have all been common complaints and added further to the reservations of those who might otherwise choose an electric car or van. 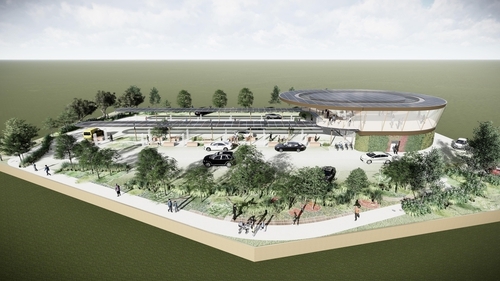 Now a British green energy firm has come up with a blueprint for the forecourt of the future, dedicated solely to EV drivers. GRIDSERVE, along with its partners, is investing £1 billion to create forecourts that will make EV charging as easy as using a petrol station on sites that will generate their own solar power and and provide ultra-fast, low-cost charging for all types of EV’s at 100 sites in the UK, and it is looking to develop many more around Europe. The sites will have dedicated zones for both private and fleet vehicles, such as taxis, buses, delivery vehicles and heavy goods vehicles. GRIDSERVE says it will take less than 30-minutes to charge most vehicles, and during this time drivers will be able to take advantage of a range of facilities including "a coffee shop, fresh food, convenience supermarket, and airport-style lounge" with high-speed internet. The company will build solar farms to supply the new forecourts with clean, low cost energy, and installing multi-megawatt batteries to provide grid services that support the rapid uptake of EVs and additional renewable energy capacity. Construction is scheduled to start on the first sites later this year including at York and Hull, where GRIDSERVE is building the UK’s most advanced solar farms. The CEO and founder of GRIDSERVE, Toddington Harper, says they plan to make charging electric vehicles as easy "as using petrol stations. The latest generation of electric vehicles are awesome, and ready for mainstream adoption, but drivers still worry about if or where they can charge, how long it will take, and what it will cost. "We plan to eliminate any range or charging anxiety by building a UK-wide network of customer-focused forecourtsthat will make it easier and cheaper to use an electric vehicle than a petrol or diesel alternative." He says the company plans to have more than 100 of these forecourts, with each supported by solar energy and battery storage. "This infrastructure will accelerate the electric vehicle revolution, serve the grid, and help the UK meet climate and clean air targets. We are partnering with operators of fleet vehicles, developers, financiers of vehicles and infrastructure, EV manufacturers, retailers, local authorities, and others who share our vision." The company promises rapid charging and that each vehicle will be able to charge at the fastest power it can support, with an ultimate rate of 500kW for cars and light commercial vehicles - offering less than 10-minute charge times. There will also be more powerful charging options for buses and heavy goods vehicles. On pricing, it promises to "deliver dependable, clean, low-cost energy that materially improves the business case for electric vehicles, and be competitive with, and complimentary to home and destination charging." The forecourts will have up to 24 ultra-fast charging bays, with batteries to support the maximum power requirements of all chargers simultaneously. A new queuing system will also minimise waiting times, and allow customers to be able to reserve charging slots in advance. An app is also being developed which will help people to plan journeys better, reserve charging slots, and pay for ancillary on-site services such as car washing and be part of a loyalty scheme. GRIDSERVE recently announced a new commercial model for solar farms, battery storage and EV charging at sites in York and Hul. The projects have been developed in partnership with Warrington Borough Council in a £62 Million deal that is expected to generate £150 Million for the council and to finance essential council services and urban regeneration. Construction on the first solar farm and battery storage system at York is now underway, and construction of the forecourts at both sites is also expected to start before the end of the year.